Look at Some of the Ford Transit Connect Technology Features | Karl Flammer Ford Inc. The new Ford Transit Connect is a cargo van that doubles as a passenger wagon and is exploding in popularity these days. Take the Ford Transit Connect out on the road and the Lane-Keeping System begins to scan the road surface to make sure you stay between the lines. If the vehicle drifts, your steering wheel receives pulses that should alert the driver, however, they will get stronger until the driver does take action. One of the overlooked features in the new Ford Transit Connect that can really help to make driving in reverse easier is the rearview camera system. As soon as you shift into reverse, this system is activated and the center console screen becomes your camera lens, allowing you to see anything moving behind you. 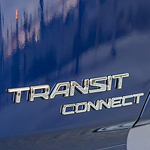 We have the all-new Ford Transit Connect in stock here at Karl Flammer Ford Inc. and available if you would like to test drive one today.